Laxmi pictured here on the right with her mate Nibbles, passed away 61/11/09 in the arms of her humans who loved her beyond belief. 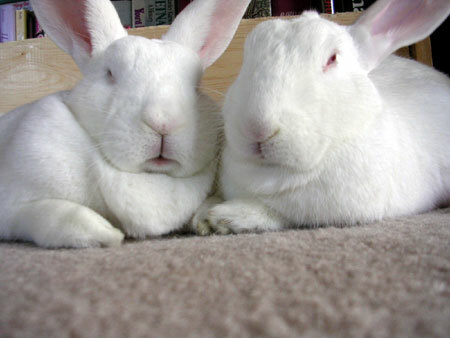 "*Yawn* hello, we are Nibbles and Laxmi, a bonded pair of spayed/neutered New Zealand White bunnies. I'm Nibbles, the chubby fellow on the left. I'm a reserved gentleman bunny with Old-World values who stays calm and eats my treats in even the most harrowing situations! I am independent and prefer to be given space to lounge on the carpet or the couch. Although I will sometimes tolerate gentle pets, I do not like to be picked up, so I thrive most in a quiet, gentle household. "My adorable bunny partner, Laxmi, is a little bundle of energy and loves to explore all the nooks and crannies of the house! She has a tear in one ear, but it has completely healed and does not interfere with her ability to be rambunctious and search for attention!